Over the past 24 hours, the internet has exploded with talk of Hurricane Florence. Bucking previous predictions, the storm has intensified dramatically while model guidance keeps drifting further and further west. That brings the forecast storm track closer and closer to the U.S. East Coast. As you may know, I heavily promote informed vigilance and patience during hurricane season. In this post, I'm going to discuss where the Florence forecast stands right now, talk about the high level uncertainty from a 192+ hour forecast, and conjecture about the potential timeline and impacts. 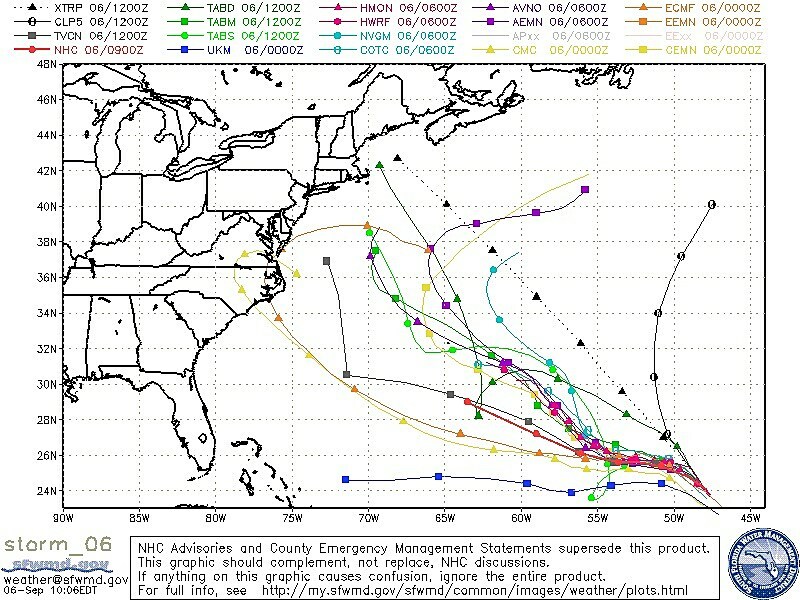 My primary intention here is to dampen the hurricane hype a little bit. But it's also important to recognize that we are now in the peak of the hurricane season, and Florence's worst-case scenario paints a pretty ominous picture for New Jersey. 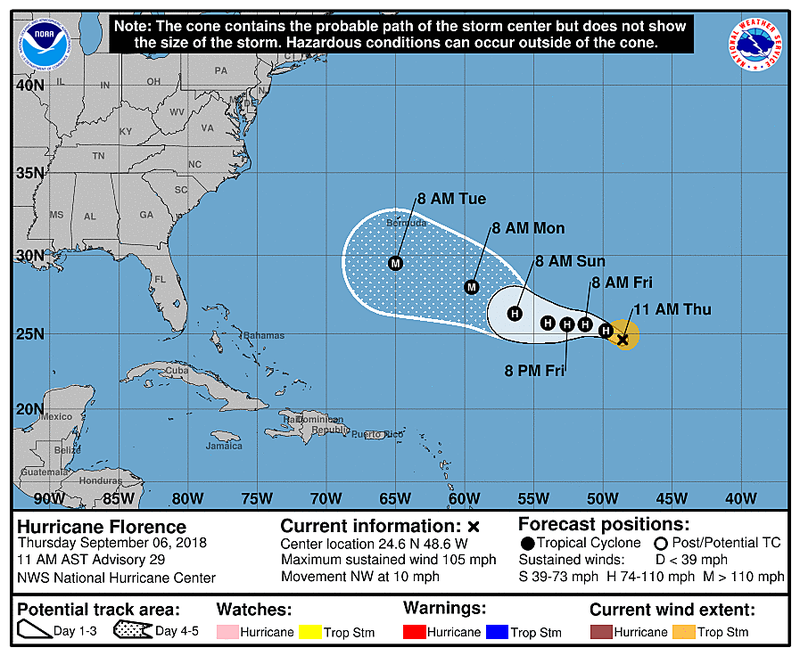 As of early Thursday morning, Hurricane Florence is centered about 1,900 miles southeast of Jersey Shore, in the middle of the Atlantic Ocean. While it had been upgraded to a category 4 storm late Wednesday, Florence has since weakened slightly to a category 2 hurricane packing maximum sustained winds of 115 mph. 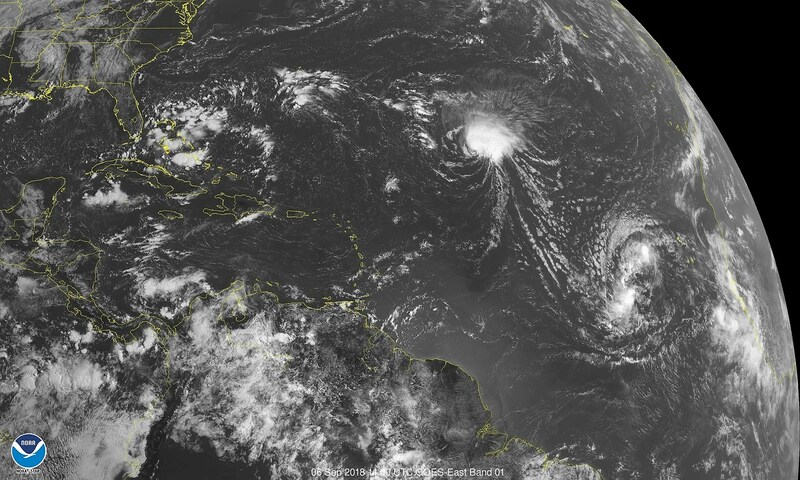 It was the most powerful storm of the 2018 Atlantic hurricane season so far, and is expected to intensify again in the coming days. Wednesday's runs of both the operational GFS (the "American") and ECMWF (the "European") models were admittedly pretty scary. Both showed Florence making a beeline across the Atlantic, with a direct hit on New Jersey around Thursday-Friday of next week. But are you really going to believe a 200+ hour model forecast? Of course not. I sure don't. Ever. Our weather forecast models are pretty good in the short-term. But even the specialized tropical tools and the expertise of the National Hurricane Center staff have an unbelievably high margin of error at that time frame. Note: I have decided against posting any raw 8-day model images here. Too dramatic, too uncertain, and too hype-y. No weather forecast is complete without a measure of forecaster confidence — how certain they are that a given weather solution will verify. Sometimes we express confidence and certainty verbally, using words like "likely" and "possible" and "chance". Sometimes, we express it as a percentage (i.e. a 40% chance of rain). And sometimes, it's best to just caution that we consider a potential weather scenario with a very large grain of salt. Let me illustrate the Florence forecast uncertainty specifically, by sharing a "tool of the trade". Ahhh, the infamous spaghetti plot. Because it looks like spaghetti! Each line represents one model's simulation of the track of Florence's center. It tells us nothing about intensity or size or geometry or impacts. Just where the lowest barometric pressure is over time. 20 difference solutions for Florence's track are displayed here. The blue line with square points (the UKMET model) is the southernmost solution. The black line with open circles (the CLP5, or Climatology and Persistence, model) is the northernmost solution. I think you'll agree that the densest concentration of model solutions is right up the middle, tracking to near Bermuda within the next 3 to 5 days. The thick red line is the "official" National Hurricane Center forecast, which favors a more southern route than the model consensus. 20 different models, showing 20 clearly different outcomes. Which one is right? Who knows. That is why it's a highly uncertain forecast. Have you ever seen a perfect 8-day forecast? Me neither. Especially for a hurricane. Obviously, Hurricane Florence is far enough away that there's a good chance it turns out to sea before reaching the U.S. East Coast. Good news for New Jersey. Bad news for Bermuda, perhaps. However, no matter where the storm goes at this point, I believe we'll be subject to some surf issues at the Jersey Shore. Any time there's a powerful storm in the Atlantic basin — hurricane, nor'easter, or otherwise — the ocean can get pretty angry. In fact, there's already a Moderate Risk of rip currents posted along the coast for Thursday, with 3 to 4 foot waves expected. Rain? Wind? Surge? Flooding? Maybe. Maybe not. This soon and this far out, there are many possibilities on the table for Florence's track and ultimate destination. That's why — contrary to many "social media-rologists" and Twitter trolls — we have to sit down, shut up, and just wait. Period. Don't worry, this storm is not going to "sneak up" on you. If Hurricane Florence does end up in New Jersey's vicinity, it looks like that would happen around next Thursday-Friday at the earliest. (That's September 13-14.) If the storm still looks to threaten New Jersey with any serious impacts, we'll pull that trigger around Sunday (at the earliest). Until then, patience and informed vigilance please. Oh, by the way... There's another tropical wave ramping up to the southwest of Florence. Also worth watching. Period.